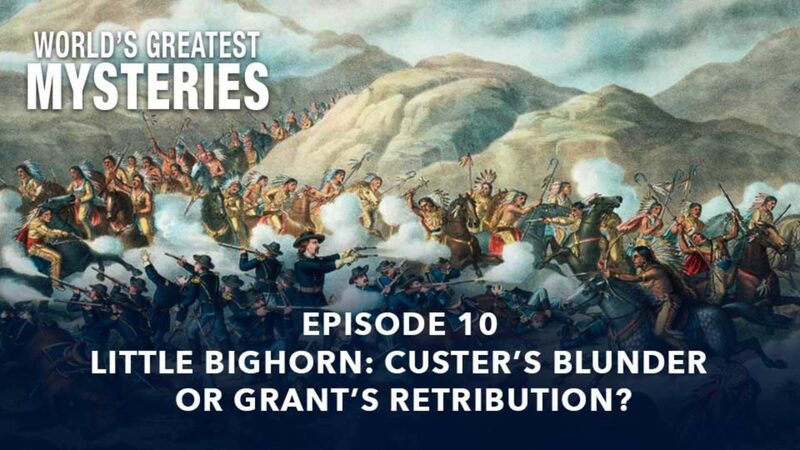 World’s Greatest Mysteries – Season 2 – Episode 10: Little Bighorn? Custer’s Blunder Or Grant’s Retribution? Was the most famous action of the -Indian Wars defined by arrogance and ineptitude ... or was it a conspiracy? The Battle of the Little Bighorn- also known as Custer's Last Stand- was a bloody engagement between the 7th Cavalry of the United States Army led by General George Armstrong Custer and a Native American force made up of Lakota Sioux and Northern Cheyenne. As we know from history books, feature films, and folklore, the Army suffered a devastating defeat. The battle took place in late June of 1876, near the Little Bighorn River in the eastern Montana Territory. A seasoned commander of the Union Army in the Civil War and earlier frontier engagements, Custer's previous battles had relied on planning, reconnaissance, and intelligence of the size and strength of enemy forces before a shot was fired. Why, then, were his tactics so ill-conceived at Little Bighorn? Custer and every man under his command died that day; so much of what has been written about the battle has been supposition. This insightful television program considers the possibility that a government conspiracy sent Custer to certain death. He had publicly exposed corruption in Presidents Grant's administration and was known to have political aspirations. This show looks into the possibility that Grant engineered a potential foe's demise. It also investigates why the 7th Cavalry was equipped with single shot rifles that jammed when he heated, while the enemy was armed with modern repeating rifles, putting Custer's cavalrymen at a decisive disadvantage.